Yes, the Washington Nationals were swept by the New York Yankees over the weekend. And yes, there were way more fans of the opposing team at Nats Park than any D.C. sports fan would care to see in one of their local venues. There are roughly 100 games left on the schedule and even after this temporary setback, the Nationals are still 12 games over .500 and hold a four game lead on the rest of the NL East. At roughly $198 million, the Yankees have the largest payroll in baseball. Conversely, Washington ranks 20th in baseball with a payroll around $81 million. The Yankees, for as long as the Steinbrenner family has been involved, have been happy to try and outspend their opponents in hopes of buying another championship. The Nationals, since coming to town back in ’05, have been irrelevant to anyone other than locals happy to have baseball back in our nation’s capital. But even after this disappointing series, it’s impossible not to notice that the Nats are legit and will likely be competitive all season long. Sunday was my first trip to the ballpark this season. 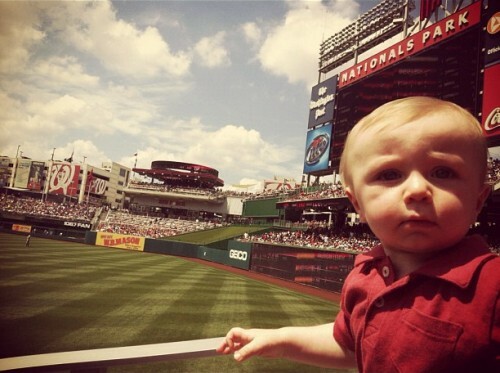 While seeing Bryce Harper in person for the first time would have been enjoyable enough, it was an even better day because it marked my son’s first-ever sporting event. Just two weeks away from his first birthday, my son isn’t really up to speed on the rules (unwritten or otherwise) of America’s pastime. Instead, he spent the majority of the day 1.) transfixed on everything going on in Washington’s bullpen and 2.) waving to the right fielders. And you know what? That was fine with me. Maybe I’m getting soft in my old age, but spending an afternoon at the ballpark with my family was the perfect way to spend my first Father’s Day. Even on a day when the Nationals struggled to put up much of a fight against New York pitcher Ivan Nova, the weather was absolutely ideal and the atmosphere at Nats Park was the closest to a playoff game I’d ever experienced. Moving forward, skipper Davey Johnson will be able to use this series as a teaching tool for his young squad. Along the same lines, my hope is that more casual sports fans will realize that this team is well worth the price of admission and start making it harder for fans of the Yankees, Phillies or whoever to get tickets. So even though the Nationals failed to rise to the challenge against the Bronx Bombers this weekend, I couldn’t care less about the final score. And more importantly, I can’t wait for the next chance to take my family back out to the ballpark for another day with Harper and friends. What we dont see is just to the kid’s left, is Bryce Harper stealing his ID so he can rent a car…..